Wow! Solar Powered $75 tablet from Bharat Electronics..
Bharat Electronics Ltd (BEL) has manufactured a tablet PC which costs Rs. 3000 and is completely Made in India in BEL’s plant in Bangalore. The amazing thing about this tablet is, it was designed, manufactured and 2000 sample tablets were shipped in just 4.5 months. BEL’s tablet runs Android 2.2 and is solar powered for the power back up. The tablet will send the data back to the central server relying on the solar powered battery. 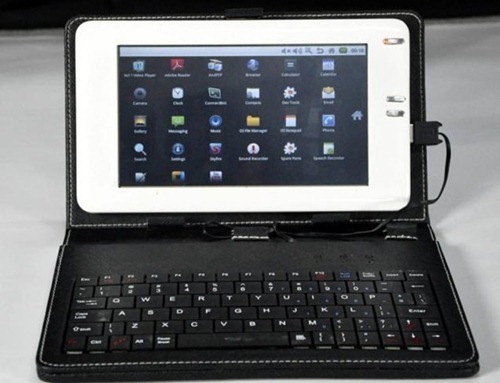 Other specifications are not known but this tablet with the leather pouch, keyboard connected with a cable seems like a practical approach for low cost computing. Asus Transformer has a similar but much sexier approach a tablet. BEL which manufactures radars and communication devices for defence department has received an order from Ministry of Rural development. This was BEL’s first significant civilian order. Rural Development ministry will be using this tablet for poverty survey. BEL will supply 6 lakh tablets as early as this November. The order is worth Rs. 1000 crores and will contribute to 15% of this year’s revenues for BEL. Guess what? This isn’t BEL’s main business but depending on the demand and growth, BEL wouldn’t mind making it a strategic business venture. BEL has spent 7 crores in building an additional facility for tablet manufacturing in Bangalore. Depending on future orders and growth it will spend Rs. 20 crores to set-up two additional facilities in Ghaziabad and Panchkula. BEL plans to come up with a different tablet version for students. Depending on the demand, BEL will open it up for retail too. Across the world the tablet prices are falling down and the cheapest tablet we have come across was the simple tablet called Noteslate which costs $99. India’s HRD ministry has boasted of a $35 tablet which is subsidized to the core, manufactured in Taiwan and needs an order of million tablets to just break even. The tablet isn’t all that attractive and looks like oversized transistor of yesteryears. But that is a tablet nevertheless and it will come out. Spending money (as subsidies) on devices which will help students is much better than letting the politicians swindle money to overseas banks. In fact, the money spent on these tablets is chump change when compared with the magnanimity and audacity of the scams we have seen in the last 2 years. Despite the obvious advantages $35 tablet from MHRD enjoys, it would be unfair for us to not compare that tablet with $75 tablet from BEL. Isn’t it amazing that BEL has designed, developed and shipped the tablets in less than 5 months? It is now ready to ship 6 lakh more tablets by November. HRD ministry took more than 2 years to and we are still waiting. What was the difference between the two projects? Is it the ‘Make it large’ bug which has bitten Harbhajan Singh too? If $35 is too cheap to be practical and if $200 OLPC is expensive for the low-cost computing needs, isn’t a $75 tablet a more practical approach? Will America drop its Pants? Stock Market says "Yes" ! The new tablets have USB hosts. In ebay, USB keyboard is available for about Rs. 1000 and with a tablet you can make one of these. Any of my friends recompiled Linux kernel? I need help as I am trying to put Indish character set in to Klingon character set in unicode table. This is part of my future project of giving mass produced lowcost android tablet in every eLiteres hand to meditate the Gods Word. Watch My Crowdfunding Projects: http://www.x.co/Xjyg. Please provide more details about the design. It looks like a tablet connected to keyboard but innovative design. very appropriate for Indian conditions. A tablet PC for such a low cost is really good.